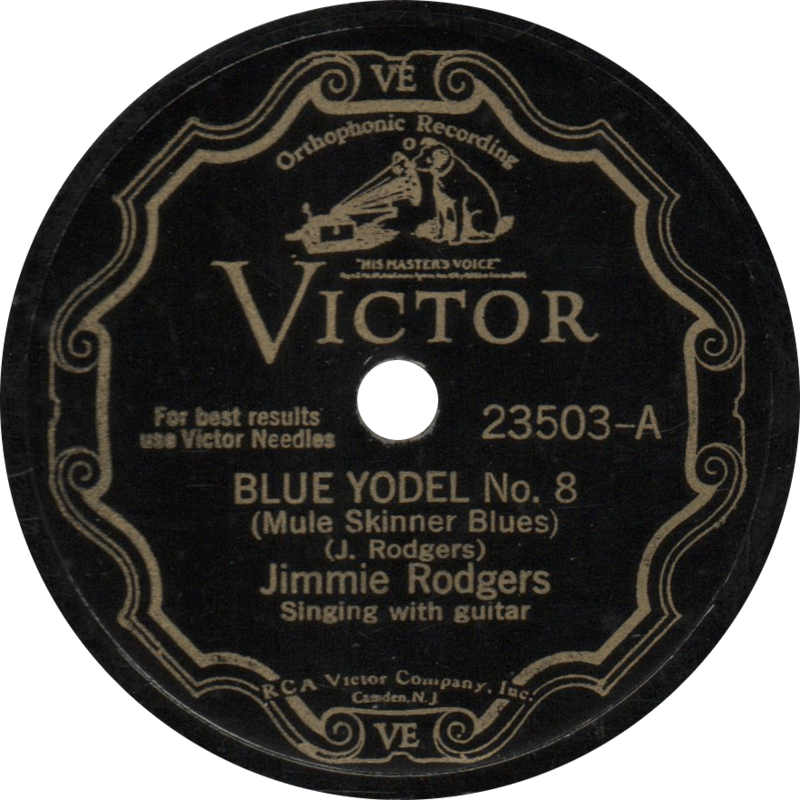 Today I present a record that stands out particularly in the annals of history, one of the best of the one-hundred-and-some-odd songs recorded by America’s Blue Yodeler, Mr. Jimmie Rodgers: the very first recording of the classic country song “Mule Skinner Blues”. An advertisement for Victor 23503 from a 1930 Victor promotional flyer. I must say that this record is something of a “holy grail” to me, it’s one I sought for a long, long time, and words cannot describe the feeling of finally having it in my grasp. I searched for what at least seemed like ages, until a nice copy finally appeared on eBay. I managed to win the auction, and after what seemed like an eternity, this one was delivered, albeit packed woefully inadequately. Thankfully, by what I can only describe as the grace of God, it made it into my possession safely in that LP mailer without the slightest damage, and boy is it a thing to behold. Victor 23503 was recorded on July 10 and 11, 1930 in Hollywood, California, and issued on February 6, 1931 in Victor’s 23500 series for “Old Familiar Tunes.” As designated by the small “o” above Nipper’s nose near the top of the label, this copy was pressed at the Victor plant in Oakland, California. Several days later, while still in Hollywood, Jimmie recorded with Louis Armstrong, who was at the time appearing at Frank Sebastian’s New Cotton Club in Los Angeles. Jimmie was in exceptionally fine form at these Hollywood sessions, and they turned out to be quite productive. In the latter of the two sessions, Jimmie cut his renowned “Blue Yodel No. 8 (Mule Skinner Blues)” in only one take, just after recording his railroad tune “The Mystery of Number Five” (Victor 23518), the only two sides he recorded that day. Rodgers’ opening line, “Good mornin’, captain. Good mornin’, shine,” appeared two years earlier in Tom Dickson’s “Labor Blues” (Okeh 8570), though the rest of the song bears no resemblance to Rodgers’ Blue Yodel, lyrically or melodically. Whether Rodgers picked up the verse from Dickson’s song or elsewhere, I couldn’t say. This recording stands out as one of a relative few that Rodgers made during the later phase of his career to feature self-accompaniment on his own guitar (fewer than half of his recordings feature his own accompaniment, and the bulk of those were made prior to 1930), and his playing is at his finest, with a rare guitar solo midway through. This was the song that introduced me to Jimmie Rodgers, and has always been one of my favorites—if not my very favorite—as well as one of Jimmie’s most enduring songs. I was first familiar with Dolly Parton’s 1970 recording, which was one of my favorites as a boy—when I first heard Jimmie yodeling it, boy, it was a whole other world! Not only did it spark my love for Rodgers’ music, but it was a major factor in starting me down the road of collecting 78 records. I could listen to it a million times and never tire. Blue Yodel No. 8 (Mule Skinner Blues), recorded July 11, 1930 by Jimmie Rodgers. On the “B” side, “Jimmie’s Mean Mama Blues”, recorded the previous day, Jimmie is accompanied by an outstandingly hot Hollywood-based five piece jazz band led by pianist Bob Sawyer, who co-wrote the tune with one Walter O’Neal. Another Rodgers classic, this tune was later covered by Bob Wills’ Texas Playboys in 1936, sung by Tommy Duncan. I love how the band stops playing during Jimmie’s first yodel, leaving just him and his guitar. We previously sampled Sawyer’s work with Carlyle Stevenson’s band five years prior to this. 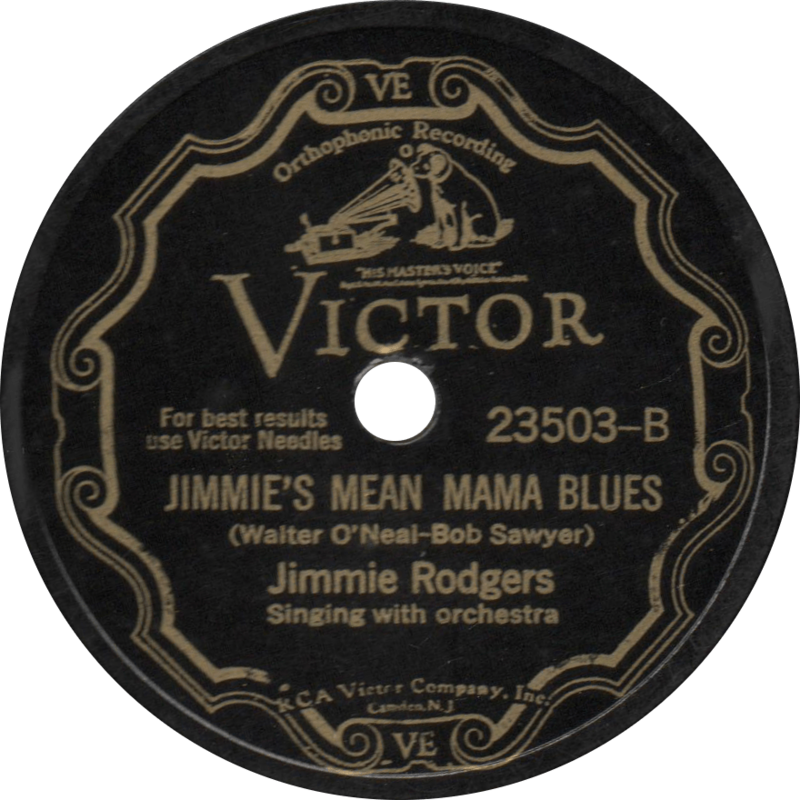 Jimmie’s Mean Mama Blues, recorded July 10, 1930 by Jimmie Rodgers. Updated with improved audio on June 20, 2017, and on July 10, 2017. This entry was posted in Records and tagged 1930, 1930s, Blue Yodel, Bob Sawyer, Hillbilly, Hollywood, Jazz, Jimmie Rodgers, Los Angeles, Singing with Guitar, Territory Band, Victor, Yodel by R. Connor Montgomery. Bookmark the permalink. Thanks for writing such a detailed article. Hope you don’t mind my asking how much you paid for this particular record(?). I have a copy and, due to circumstances beyond my control, must sell my record collection. I have a friend interested in buying it, but neither of us know what a fair price might look like. It’s in good condition. Estimating the value of 78s is tricky, since it really just comes down to whatever a buyer is willing to pay, but I would say that average copies of Victor 23503 (V+ to E- or whereabouts) usually run around twenty to thirty dollars at auction, give or take. Mint copies sometimes fetch considerably more, and lesser copies would naturally sell for less. I paid around $37 on eBay for this copy.